Gains in consumer discretionary and industrial names pushed Wall Street higher on Monday. Tax reform concerns continue to perplex investors. Stocks edged higher by the closing bell on Monday, Nov. 20, as Wall Street staged a rebound from two straight weeks of losses and the consumer sector powered gains. The Dow Jones Industrial Average added 72 points, or 0.31%, the S&P 500 rose 3 points, or 0.13%, and the Nasdaq increased 8 points, or 0.12%. Gains in consumer discretionary and industrial names offset continued underperformance in the energy sector. The Consumer Discretionary Select Sector SPDR ETF (XLY - Get Report) gained 0.20%, and the Industrial Select Sector SPDR ETF (XLI - Get Report) increased 0.47%. The Energy Select Sector SPDR ETF (XLE - Get Report) declined 0.24%. West Texas Intermediate crude oil futures settled lower by 46 cents to $56.09 a barrel. The Dow was pushed higher by heavyweight leaders Home Depot Inc. (HD - Get Report) , up 2.76%, and Verizon Communications Inc. (VZ - Get Report) , up 1.76%. The blue-chip index's worst performers were General Electric Co. (GE - Get Report) , down 1.4%, and Merck & Co. (MRK - Get Report) , down 1.9%. The Nasdaq's modest gains were weighed down by a selloff in biotech stocks. While the Technology Select Sector SPDR ETF (XLK - Get Report) gained 0.38%, the iShares Nasdaq Biotechnology ETF (IBB - Get Report) fell 0.93%. After stocks ceded gains for the second week in a row last week, investors now face a thin-trading shortened Thanksgiving week light on both earnings and economic events. Markets will be closed on Thursday, Nov. 23, for Thanksgiving, and will open for a half-day of trading on Friday, Nov. 24. Tax reform continues to occupy the minds of investors, pulling stocks back from recent highs even as the Republicans' tax bill made progress in the House of Representatives. Concerns still abound that tax legislation might not happen before lawmakers' Christmas break, as the House and the Senate still have differing proposals that have not yet been reconciled. There are no scheduled official events surrounding either tax reform bill this week. In Europe, stocks ended higher as German shares recovered following the break down of coalition government talks over the weekend. The pro-business Free Democrats walked out of the talks, leaving Chancellor Angela Merkel with the likely option of having to form a minority government with the Green party or calling fresh elections in the new year. Leading Indicators for October rose 1.2%, doubling the estimates of economists polled by FactSet. The index rose 0.1% in September. Earnings reports are expected at the closing bell Monday from Agilent Technologies Inc. (A - Get Report) , Hewlett Packard Enterprise Co. (HPE - Get Report) , Intuit Inc. (INTU - Get Report) , Palo Alto Networks Inc. (PANW - Get Report) and Urban Outfitters Inc. (URBN - Get Report) . Alibaba Group Holding Ltd. (BABA - Get Report) agreed to acquire a major stake in China's largest supermarket operator, Sun Art Retail Group, as the Chinese e-commerce giant continues its push into bricks-and-mortar retailing. Alibaba will pay just under $2 billion for a 36% stake in Sun Art Retail. 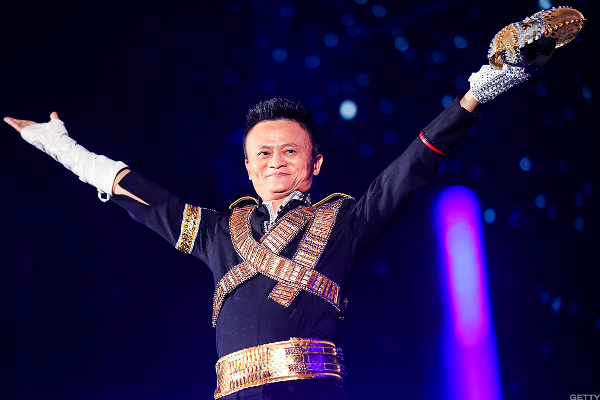 Alibaba's Jack Ma signing off on deals. The deal could pit Alibaba against both Amazon.com Inc. (AMZN - Get Report) , the world's biggest online retailer, and Walmart Stores Inc. (WMT - Get Report) , the world's No. 1 bricks-and-mortar retailer. Alibaba's move looks similar to Amazon's $13.7 billion acquisition of Whole Foods Markets earlier this year and positions Alibaba at the forefront of a $500 billion food market in the world's second-largest economy and a global market worth more than $4 trillion. Alibaba shares gained 1.6% to $188.10 on Monday. In a deal that could create a more capable competitor for chip giants such as Intel Corp. (INTC - Get Report) and Broadcom Ltd. (AVGO - Get Report) , Marvell Technology Group Ltd. (MRVL - Get Report) has agreed to buy Cavium Inc. (CAVM for about $6 billion. Under the terms of the definitive agreement, Marvell will pay Cavium shareholders $40.00 in cash and 2.1757 Marvell common shares for each share of Cavium common stock, Marvell announced early Monday. The transaction is expected to close in mid-2018. Cavium shares rose 10.8% Monday and Marvell shares increased 6.4%. Broadcom is a holding in Jim Cramer's Action Alerts PLUS Charitable Trust Portfolio. Want to be alerted before Cramer buys or sells AVGO? Learn more now. Walmart stock was close to flat Monday after analysts at Goldman Sachs said the retailer's impressive nearly 40% year-to-date gain could be set for a cool-down. The firm cut Walmart's stock to neutral from buy while assigning it a $100 price target because of its current valuation. Goldman's downgrade is predicated on Walmart's "progress in growing earnings while investing in its business has been recognized by the market, as the stock's multiple has surged," Goldman analyst Matthew Fassler said. Qualcomm Inc. (QCOM - Get Report) is set to win "imminent" Japanese antitrust clearance for its $38 billion bid for NXP Semiconductors NV (NXPI - Get Report) and gain approval in Europe by the end of the year with slight changes to its concessions, a person familiar with the matter told Reuters. Gaining approval in Japan and Europe for its purchase of NXP could reinforce Qualcomm's fight against an unsolicited $103-billion takeover bid from Broadcom. Qualcomm has rejected the offer, saying it wasn't enough and even if it was the tie-up would likely face regulatory hurdles. Bitcoin rose to a new all-time high on Sunday, Nov. 19, as the cryptocurrency surged above $8,100. CoinDesk's bitcoin price index showed it reached over that threshold to $8,101.91 between 3 p.m. ET and 3:15 p.m. on Sunday. By Monday's close, bitcoin was trading even higher to $8,230.10 per coin. Société Générale SA (SCGLY said in a brief statement on Monday that it plans to offer Apple Inc.'s (AAPL - Get Report) Apple Pay to its customers soon. It's an important step for the smartphone payment system, as Société Générale is the first major retail bank to sign on, according to a report from NDTV's Gadgets 360. Apple already struck deals in France with some savings banks and a startup online bank created by telecom company Orange SA (ORAN , plus supermarket chain Carrefour SA (CRRFY . NXP and Apple are holdings in Jim Cramer's Action Alerts PLUS Charitable Trust Portfolio. Want to be alerted before Cramer buys or sells the stocks? Learn more now. TransCanada Corp. (TRP - Get Report) shares gained 1.29% on Monday after the Nebraska Public Service Commission approved the company's controversial Keystone XL pipeline plans. The commission voted 3-2 in favor of allowing the pipeline's construction to continue, but voted against TransCanada's preferrred route. The group instead passed the "Alternative Mainline Route," which will affect roughly 40 landowners who otherwise would have been unaffected by the pipeline.